The bocce team poses with their trophy after winning the divisional championship last Saturday. The win earned the team their second straight division title. When special education teacher Stephen Sutherland arrived at Whitman 13 years ago, he had never heard of bocce before. But four years later, when former principal Alan Goodwin asked if he wanted to coach the corollary bocce team, he agreed. 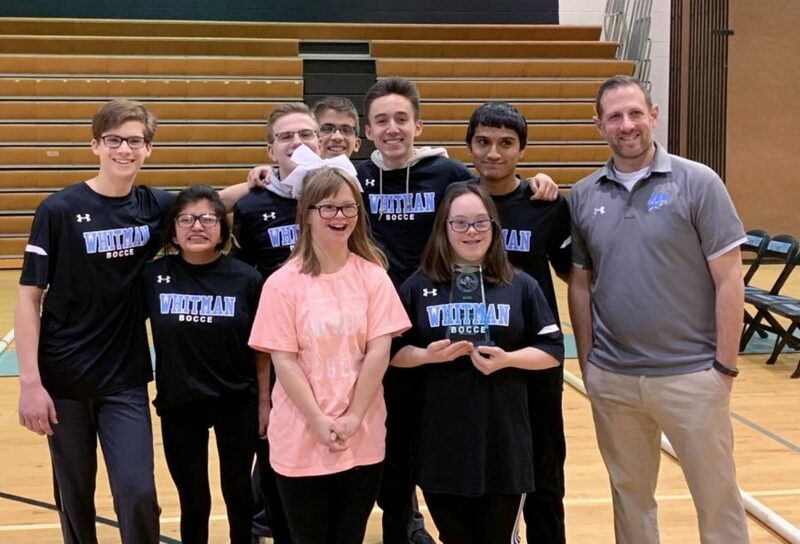 Last year, in Sutherland’s second year back coaching Whitman after teaching at BCC for 5 years, the bocce team won the county championship. And tomorrow, after finishing the regular season undefeated and winning divisionals last weekend, the team will compete for its second straight county title. Bocce is a corollary sport, which means it’s a mixture of special education and general education students. In 2008, Maryland passed a law that called for equal opportunities for students with disabilities to play on high school sports teams, creating corollary sports. Bocce came to MCPS nine years ago after a failed corollary track and field team. Track and field didn’t naturally allow people of differing abilities to compete, but bocce lets everyone—regardless of physical disabilities—play an important role in the success of the team. All but one of the 26 MCPS high schools participate, which makes bocce the most popular corollary sport in the county. In bocce, players roll a small white ball, called the “pallino,” at the beginning of the game. Each team has four larger “bocce” balls, and the goal is to roll the bocce balls as close to the pallino as possible. Games typically last an hour to an hour and a half. For a while, bocce was mostly played in Europe;, but after the first Special Olympics in 1968, it started to gain traction in the United States. Though practices are relaxed (during Wednesday’s drills, the team sang several choruses of “How Far I’ll Go,” from “Moana”), Sutherland makes sure the team works hard. The year before Sutherland returned, their record was 0–6. This season, they’re currently 7–0. Team member Gabby Fleming joined her freshman year, and she quickly bonded with her teammates. 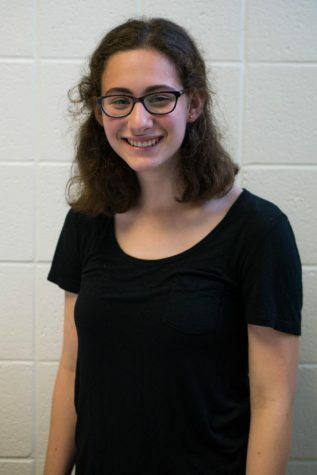 She has fun spending time with her friends at practices and enjoys away games at Churchill, B-CC, Walter Johnson and more. The team has two practices and one game each week. Games are held in the gym, with PVC pipes forming a narrow rectangle on the basketball court where the teams roll. Players can bounce the bocce balls off the pipes to try to roll closer to the pallino. But, since the basketball teams practice in the gym, the bocce team holds drills and scrimmages in the hallway outside of Sutherland’s second-floor classroom, where they substitute lockers for pipes during practice. Sophomore Jonah Leonhardt joined the team freshman year, and he liked it so much that he got a bocce set at home for practice. This year, he started playing in another league outside of school, which meets once a month and is one-on-one instead of a team. Leonhardt likes bocce because of the strategy, he said—players have to decide whether to aim their ball toward the pallino or to try to knock the opposing team’s balls away. Jonah’s freshman brother, Felix, joined bocce this year after watching Jonah’s games last year and thinking they looked “awesome.” The Leonhardts already had a close relationship with Sutherland because he coached Felix’s old baseball team. A few weeks ago, PE teacher Joseph Cassidy hung their county championship banner from last year in the gym. Sutherland said seeing the team’s reaction—Jonah’s in particular—represents one of his favorite parts of coaching. This Saturday, the team is headed to Paint Branch to play in counties and will hopefully hold onto their championship title from last year. If they win, they’ll advance to the state championship, which is run by the Special Olympics instead of MCPS. Because it’s a corollary sport, the team has to consist of at least 50 percent special education students; but on the court, it makes no difference who’s special education and who’s general education, Sutherland said. At the end of the game, everyone is high-fiving. The county championship will take place Saturday 10 a.m. at Paint Branch High School.